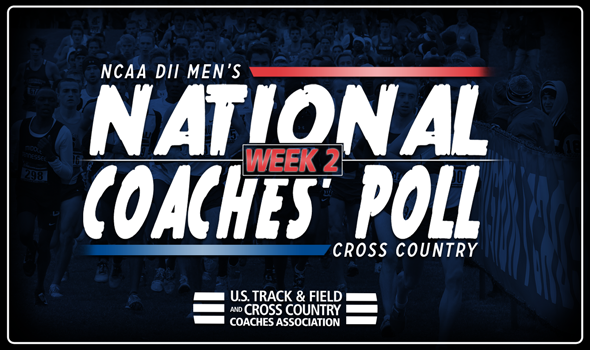 NEW ORLEANS – If your team was in the top-five of the NCAA Division II Cross Country Men’s National Coaches Poll a week ago, you’re in good shape. But if your team wasn’t, it would behoove you to take a peek at the rest of the poll. The second week of the coaches’ poll, released by the U.S. Track & Field and Cross Country Coaches Association (USTFCCCA), saw some interesting things take place from spots five on down. The regular powerhouses headlined the rankings once again, as Adams State, Grand Valley State, Colorado Mines and Chico State held onto the top-four spots. And while Southern Indiana was also technically in fifth, they had to share the ranking this week, as Mount Olive jumped up two spots to tie the Screaming Eagles. The tie for fifth marked the first time the Spartans have appeared in the top-five of the polls in the history of the program. As for the rest of the polls, some teams made huge jumps in the rankings, while others made their season debuts. Queens (N.C.) vaulted to ninth place after coming in at 22nd in the last poll. The Royals returned to the top-10 for the first time since the final poll of the 2010 campaign after winning the Stegemoller Classic National Preview, thanks in large part to the performances from Tom Bains (24:25.3 – second) and Nick Kipkemei (24:32.6 – third). Joining the Royals in making into the top-10 on the week was Lewis, who moved up three spots to 10th for the program’s first top-10 ranking since the third week of 2002. The Flyers also competed at the Stegemoller Classic National Preview, placing third with James Frederickson (24:46.0 – sixth) leading the way. Cal Baptist moved up one spot to eighth, while Cal Poly Pomona (seventh) rounded out the top-10. Simon Fraser’s women’s team moved into the top-five for the first time in program history on the week, but the men’s team also made a splash of their own. After not being ranked in the preseason poll, the Clan has continued to climb in the rankings, moving up four spots to tie for 13th on the week. Simon Fraser came in second at the Sundodger Invitational last weekend. Three teams entered the top-25 for the first time on the season in Bellarmine (t-13th), Rogers State (16th) and Dallas Baptist (24th). Additionally, Stonehill returned to the polls at 22nd after falling outside of the top-25 a week ago.